The hotel has 84 rooms. 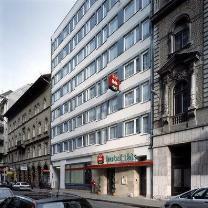 Hotel Ibis Budapest City is in the heart of the city, easily accessible with any public transportation lines. It offers ideal accommodation for people on holiday or business. - Parking: Garage and parking places are available on special conditions. Hotel Emke is situated in the heart of the city. 1 km from the East and 2 km from the West railway stations. The hotel has easy access to public transport: bus no.7, underground (line no 2. ),tram no. 4-6. The business and shopping centre are within walking distance.